You are invited to our Fall Fashion Frame Fest. Full collections of ProDesign, RayBan, and Spy eyewear. Along with Essilor, the makers of Varilux, Transitions, and Crizal lenses, learn the latest in lens technology. It is going to be a lot of fun, with prizes, and 25% off select designer frames. Schedule an appointment for Oct. 2nd and receive a free Optomap image (retinal scan). 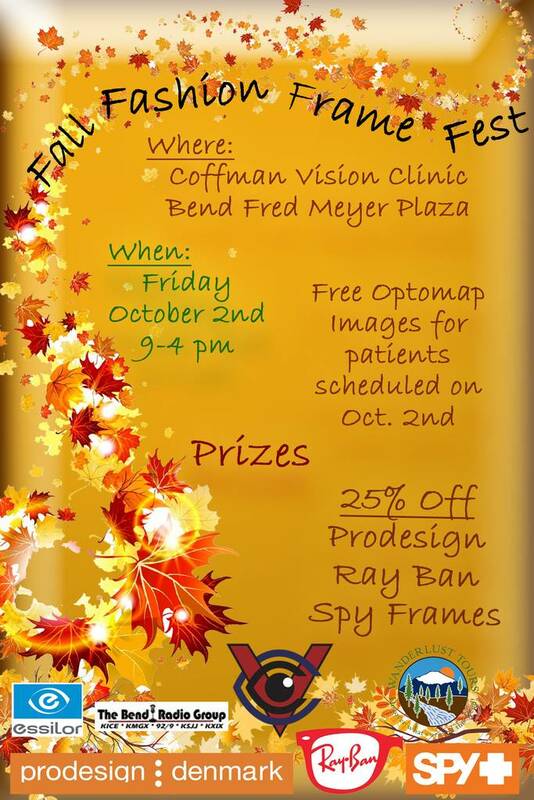 Come and enjoy the Fall Fashion Frame Fest at Coffman Vision Clinic in the Bend Fred Meyer Plaza!